The nose has lavender, monstera, peaches, polished furniture, and hints of beeswax. The mouthfeel is decent but has no cling. The body has peach, monstera, melon, tea chests, soft toffee and polished furniture. The finish has peach, lavender and toffee. 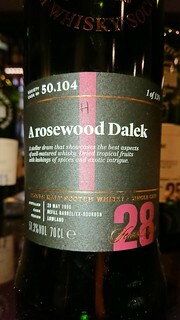 A really great dram, which has plenty of fruit without going too deep into the wood and tannins. One for summer evenings with friends.